Beer, bicycles, strip clubs, an imminent, deadly earthquake -- Portland is well-known for many things. Our notoriety also extends to our dog ownership, though many Portlanders would recoil at the notion that one could "own" such a noble creature as the dog. We have dozens of dog parks and even more dog-friendly parks; we have pet stores and a 24-hour veterinarian clinic; and, because we love to drink so much, we have a number of dog-friendly bars and restaurants. We’ve rounded up some of the best places in Portland to take your dog, because we know you can’t stand to be away from them for more than a few hours. 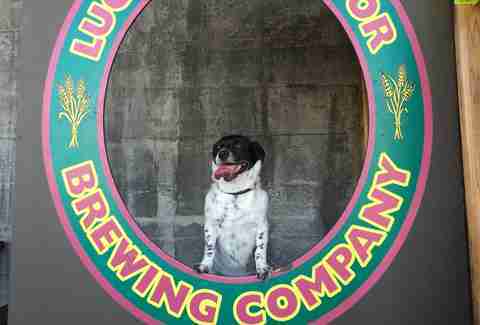 The original dog bar, the Lucky Lab chain loves dogs so much, it named itself after one of our furry friends. There are currently four different locations for the brewing company, and each boasts a dog-friendly patio, complete with water bowls and places to take ridiculous photos of your dog (see above). 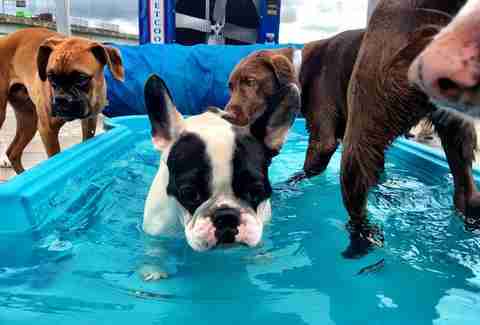 During the summer months, the NW location especially is packed with pooches. There are going to be a few Mississippi St. locations on this list; apparently NoPo residents have a lot of dogs, and the bars around there cater especially to this fact. Prost! has an excellent patio that is accessible from the street, with an outdoor bar so you don’t have to leave Patrice, your dog and No. 1 best friend, for even a moment. On weekend nights, the White Owl is overflowing with young suburbanites and Westside hipsters lining up to see shows. But during the day, it’s one of the best bars in the city to bring your pup… whom you couldn't envision ever leaving at home while you day drink. Wednesdays are Yappy Hour, which means drink specials for dog owners, treats for dogs, and even a show & tell: pups are brought in from shelters for playtime and possible adoption. White Owl regularly uses these as opportunities to donate to animal charities. Another Mississippi spot (warned you), The Rambler has a covered back patio and an open front patio, both of which are very dog-friendly; you’re bound to see an animal friend any time you visit this great neighborhood bar. There’s a bocce ball court along the side of the bar, but no worries: the stone balls are far too big to fit in most dogs’ mouths. 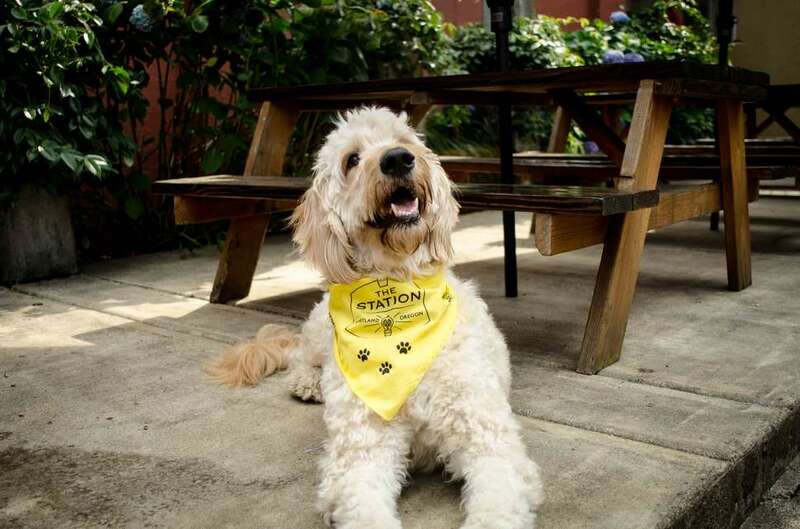 A neighborhood pub that turns into a sports bar on game days, The Station is also a decidedly pro-dog bar: free doggy bandanas, a patio with umbrellas, dog bowls, dog treats, and doggy bags to clean up any business they may attend to. There’s even a doggy food menu, and this summer The Station is going the extra step with Pints for Pups -- on Thursday nights, $1 for every Lagunitas bought will go to the Oregon Humane Society. Tin Shed is a family-friendly (and dog-friendly) restaurant that boasts a full bar. A popular brunch spot for dog owners especially, Tin Shed has its own pup menu, so your four-legged friend can get her own doggie meal, including dessert. Tuesdays are Doggie Love Night: buy one people-priced item, and get one free dog dinner. Win-win. While every bar on this list is friendly toward your dog, most restrict your pooch to the outside areas. Not so at Velo Cult. This bike shop and taproom welcomes you and your dog to cozy up inside. Bikes, beers, and dogs make this maybe the most quintessentially Portland spot out there. No, wait, definitely the most quintessentially Portland spot out there. "Have a drink with your dog" is the slogan at Sniff Dog Hotel. Of course Portland has a dog hotel that’s also a bar, where you can relax with a glass of wine or pint of beer while your dog plays in the indoor park. Happy hour is 5-7pm Sunday through Friday (Sniff is closed Saturdays during the summer) -- that's when Patrice can romp and play for free. Tuesdays and Thursdays during happy hour are for small dogs only (20 pounds or smaller), so if you have a Boston terrier or dachshund, bring them by then. The field in front of the Washington High School has long been a popular dog park, but there wasn’t much for owners to do but watch their companions play. Now, with Revolution Hall and its cafe and bar, Marthas, dog owners can sit out, drink a latte, beer, or cocktail, and lazily throw balls from the comfort of their chairs. The co-owner of Victoria Bar, Lisa Hare, loves her own dogs so much she would never run a bar that doesn’t allow you to bring your own. 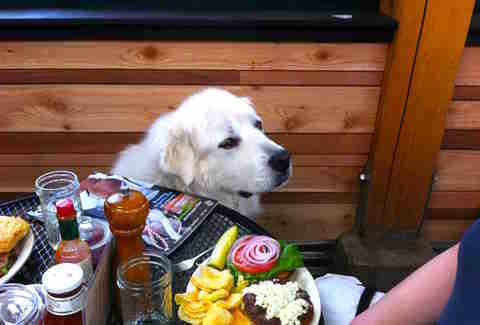 Victoria Bar has a large side patio that’s always filled with happy pups, looking to help you finish that platter of tasty looking waffle fries you have there… whether you want to or not. Alex Frane knows that drinking is objectively better when there are dogs around to hang out with. 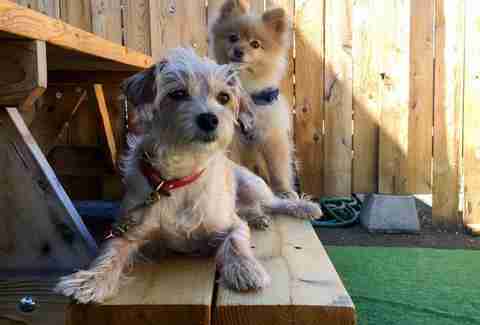 Track his dogspotting and drinking habits at @FraniacDrinks.